THE MAN, who evidently considered that he knew all about the energy efficient design of buildings, commented that the design was wrong — why would anyone put large glass doors on the western side of the building where they will let in the hot, late-afternoon summer sun? Maybe he did know all about the design of buildings, the theory, anyway. We’ll get back to that in a minute. We’ve all seen this sort of thing… a permaculture designer or educator or someone else pronouncing judgement on a building, a garden or something. All too often, though, the judgement comes from the theoretical knowledge passed on in permaculture design courses. It’s technical knowledge… knowledge of how things should be… a statement of the ideal and not a statement about dealing with the messy, imperfect realities of the world. This sort of knowledge is not knowledge anchored in the real world of real projects. That is far more compromised. That, though, is the reality of doing projects in the world. An instance: years ago I was visiting a long-running intentional community in northern NSW, one of the first to be set up. There, the man showing us around told of how a student, who had just completed a permaculture design course at a well-known, nearby rural teaching venue, had visited and asked whether the landuse design really was permaculture… because it had no swales. “We have no swales because we don’t need them”, replied the man showing him around. Had the visitor known who he was questioning, he might better have said nothing. The swale-less man was a water expert who taught water systems, including waste water reuse, at the local university. the idea of giving much land area to tree crops rather than the annual and perennial vegetables and grains that provide most of our food (though intensive vegetable production through, for example, the biointensive method of garden agriculture enables us to use less area for annuals and more for perennial tree and shrub crops or grazing paddocks on farms). the belief that local initiatives can by themselves create broad change (when they need to be networked to enable cooperation, mutual learning and assistance to do that, otherwise local stays local). All of those practical things are valid design inclusions but we need to ask when those ideas are best applied or whether there is some other, more effective technique that perhaps comes from outside the permaculture orthodoxy. Importantly though, when do these design bits need adapting and what do we do when circumstances don’t allow us to use them. Insisting on their use is a one-size-fits-all approach to permaculture design which, as anyone who has designed anything will know, is the road to failure. The permaculture design course equips us with principles to guide the design of what we will build. That’s good of course, and those principles are of great value. But they are principles and principles, as already said, are a guide, not a prescription. They are not laws like the laws of physics. They require selection and then adaptation when it comes to implementing them. Take that building. It has large glass-doors facing west because that was a client requirement. As designers, we can advise but we have to design and build what the client wants. Had our judgemental friend not pronounced the building a failure and asked the right question of it, the placement of the glass doors would have made sense. Rather than condemning the structure according to his theoretical knowledge, the question he would have better asked is: ‘Why does this building have large glass doors facing the hot, setting summer sun in the west?”. That, unlike his off-the-cuff condemnation, is an open and enquiring question that would have solicited an answer that led to understanding. He would have learned that those glass doors were so-placed because the client wanted a building that opened onto the grassy oval so that the building could serve as a performance space. That was a client need, a design requirement, imperfect it might have been in terms of design theory. He would also have learned that the building is incomplete, that a retractable, western side awning was to be installed to shelter those doors from the hot summer afternoon sun and that it would be installed in time for the return of hot weather. He was looking at an incomplete building but didn’t know that — because he made a statement based on incomplete information and because he didn’t ask enquiring questions. Understanding should precede condemnation. Something else he would have learned was that the building was designed by an architect specialising in energy efficient structures and who knows very well what he is doing. This is the problem with theoretical knowledge. It is sometimes inapplicable in the real world where designers have to build what their clients want, irrespective of whether that compromises theoretically good design. 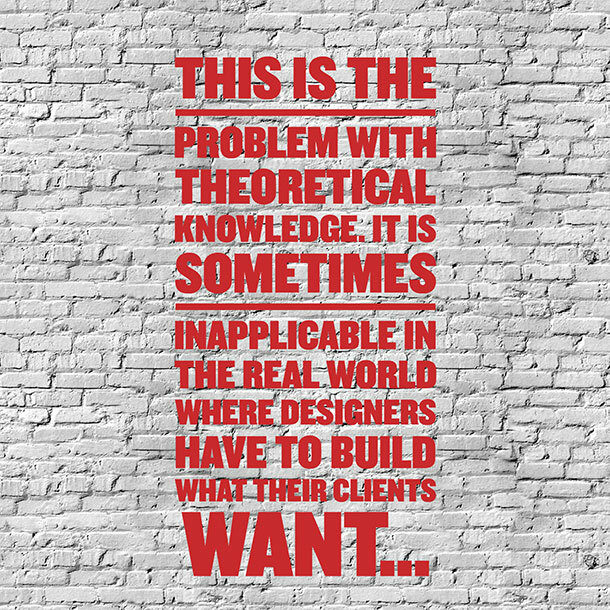 The challenge then is to ameliorate the undesirable effects of client needs as they affect design. This was an assignment in a permaculture design course. The challenge: Design a productive system on public land. The site: A steeply-sloping, conical hill surrounded by flat land. The top of the hill was used by the public as an outlook as it gave fine views over the city. The student’s solution: Excavating swales across the entire hill so as to grow food on it. As this was public land, obtaining permission for the works from the local government, the landholder, which would rightly have raised questions of slope stability and costs. This— understanding how government regulates landuse and how that creates opportunities, barriers and design compromises in the real world of projects — can be missing in permaculture education. Assess the land capability of the slope to determine its suitability for cultivation (degree of slope, soil type, potential for soil erosion and stabilisation in relation to the type of landuse envisioned). Obtain authoritative civil engineering advice on making and stabilising earthworks on a steep slope. Lay out swales at appropriate spacing relative to the degree of slope and the avarage annual rainfall, anticipated runoff and soil type on the slope. Hand excavate the swales — the slope was too steep for a mechanical digger. Design consideration: Were the summit of the hill to be planted the view of the city that visitors enjoy would have been lost. That would have constituted a social loss as well as loss of a viewpoint from which to understand the city’s geography. Other solutions: Yet… that hill in the students’ design assignment… all around its base was flat land where food production could have been done far cheaper, with little by way of earthworks and which could be harvested with far less effort that than on the severely swaled, steep slope. This was a classic permaculture error of treating the city as a farm while ignoring the other values of public open space in urban environments such as those of mental health, physical exercise and the larger urban experience like those distant views from the hilltop gave in creating a sense of place. Permaculture educators have set assignments for their design course students that are devoid of the real-world limitations imposed by client needs, landuse zoning or local government regulations. Perhaps they should throw in a few other limitations like limited budget, poor site conditions and client needs that clash with good design theory. That would get their students ready for design in the real, not the theoretical world. The take-away here is to recognise that design in the real world involves compromise. So, perhaps it is better to avoid condemning and fault finding such as that statement about the building made by the visiting ‘expert’ and, instead, ask an enquiring question likely to elicit understanding, such as ‘why was it designed like this?’.